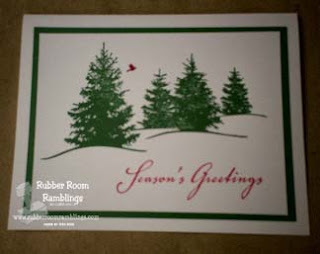 Rubber Room Ramblings: SCENIC SEASON SIMPLICITY! This has got to be one of the most beautiful stamp sets that I have, and it is so quick and easy to make an awesome card with! This is another one of the cards we'll be making at my Holiday Stamp-A-Stack this month. Check out my calendar HERE for all the class details! When I mounted this stamp set, I took the sentiment (Season's Greetings) and separated it from the trees so I could mount it on a separate wood block. This makes it a lot easier to use the sentiment with other stamps and to stamp it in another color without markering it, or just to change the placement of it. So, for this card, all I did was put a little post-it note mask over my little bird, then inked my stamp with Garden Green Classic ink. I then removed my post-it note mask and colored my bird with my Real Red marker and stamped that image onto Whisper White Cardstock. I inked my sentiment with Real Red Classic Ink and stamped it in the bottom right-hand corner, mounted it onto a piece of Garden Green Cardstock and called it AWESOME! !